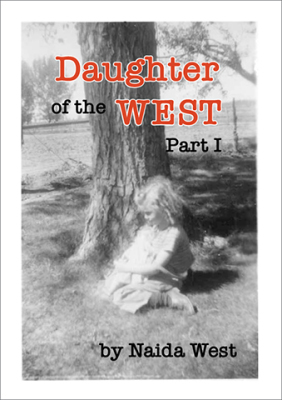 This memoir links Naida’s West’s unusual past to many of the happenings and some of the characters in her novels. Inspired by Mark Twain’s personal Autobiography, she follows some threads to the end of her life, and then returns to the earlier place where she left off. Though the memoir is not always chronological, it is more like the way people recall the past. 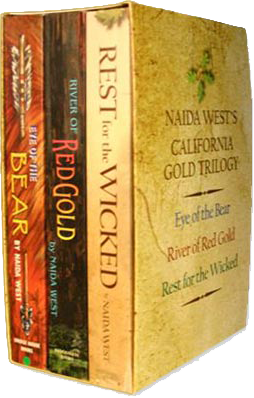 Each book of the trilogy tells a forgotten story about people and events in central California. Each one can be enjoyed without reading the others, though history buffs insist they must be read in sequence. The spirit of a native woman lodged in an oak tree narrates all of them, and each one has substantial endnotes that provide more information about people and places. The books are required or recommended in college classes across the US and UK, but the author's dearest fans come from all walks of life and all age groups, except for young children for whom some scenes are inappropriate. Grizzly Hair leads a combined force of formerly peaceful native peoples in a fight for freedom from the missions — freedom to leave when they choose. With bows and arrows they defeat the Mexican military equipped with cannon and muskets. To achieve that victory they must first see each other as one people. For about 600 years the central California peoples developed ways of keeping the peace between hundreds of “triblets”, all speaking different languages. The intent of the Spanish padres was to spread the Christian message of Peace and Love, but the padres and their military guards gave the natives cause to rebel, and they inadvertently provided them with two major tools of warfare: a common language (Spanish) and faster transportation (horses). Elitha Donner’s stunning story was untold until this book was published. Her first name rhymes with that of her half-sister Eliza, a 3-year-old when they were snowbound. In the chaotic aftermath of the Donner Party, Elitha’s name was likely mistaken for a lisped version of Eliza. Before long the two girls were thought to be the same person, namely Eliza, the youngest daughter of George and Tamsen Donner, who married a successful man in the Bay Area. In the many films and videos about the Donner Party and a book-length poem by George Kiethley, Elitha, 14, the oldest orphaned daughter of George Donner goes unmentioned. She had a Native-American mother that died before George Donner married Tamsen. She cared for her 4 sisters at Sutter’s Fort and married Perry McCoon, who was already married to Indian Mary. How Elitha and Indian Mary help each other survive the Gold Rush is a major theme of this book. 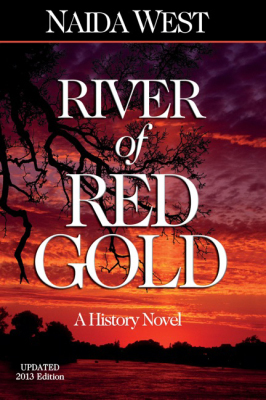 This final novel in the trilogy continues the sagas of a Miwok family and the first settlers along the Cosumnes River, while introducing fictional Mae Duffy, 16. She leaves her family and goes to the Sacramento, hoping to rise to fame and fortune. But she is easy prey in a corrupt world where pretty girls are political favors. She dances and dines with high status men at the state capitol, and she rides the cable cars in San Francisco with the only Legislative aide; he also manages the girls. In Sacramento’s underground she breaks free and returns to the backwaters of the gold country, pregnant and emotionally broken. Her father is dead, her mother gone, but Mae learns about life from two old women: Ah Sen and Indian Mary. She also finds real love with Mary’s son Billy McCoon, the last man of his people. Billy and Mae move to a hard-rock mine where he can pass for White and get paid for his work, but Mae’s past comes to haunt them. Based on a true-life murder. Frieda is isolated in a wilderness with a husband who hunts more than big game. Set in 1917 along the Salmon River in Idaho’s River of No Return Wilderness. The spunky daughter of a Scottish Presbyterian minister immigrates to Utah, keeps her father’s faith and her sense of humor while teaching school and mothering six children during the Great Depression. 1887-1905 in Scotland. 1905-1976 in Utah and Idaho.